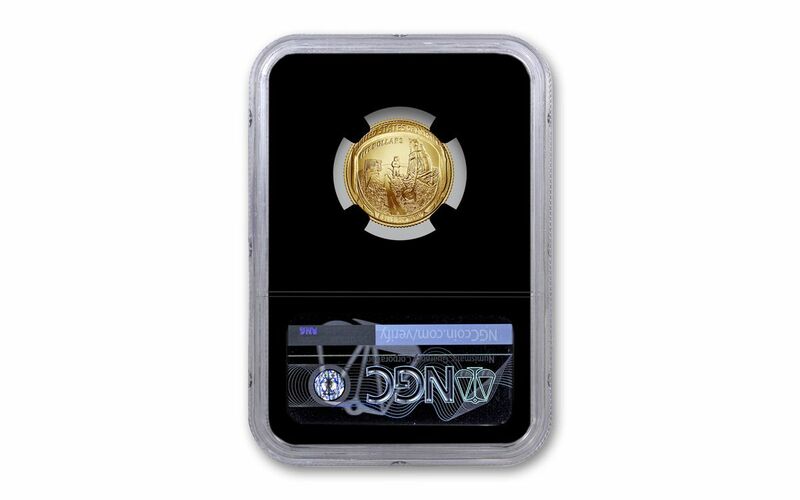 In honor of the 50th anniversary of the Apollo 11 mission, Congress authorized the release of this special, limited-edition commemorative $5 gold coin. Not just any gold coin, it represents just the second time in history that the U.S. Mint has struck a coin with a curved surface! On the coin’s obverse is the indented footprint left by astronaut Neil Armstrong along with the names of the space programs that led to such a historic moment: MERCURY, GEMINI and APOLLO separated by phases of the Moon. Flip the coin over and you’ll see the outward curve of an astronaut’s helmet. The design recreates the famous photograph snapped by Buzz Aldrin of Armstrong standing next to the lunar module Eagle as seen through Buzz’s visor. 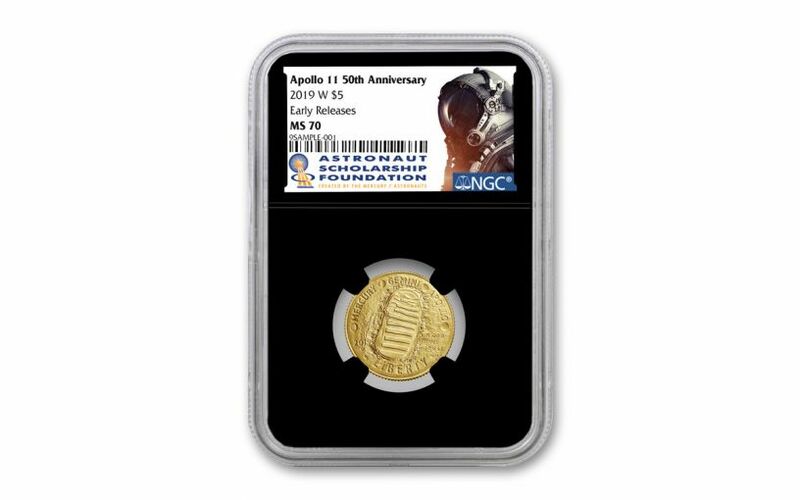 In addition, NGC has certified your 2019-W $5 Apollo 11 50th Anniversary Gold piece to be an Early Releases (ER) coin, meaning that it was among the first struck by the mint and was verified within the first 30 days of issue. Your coin will come sonically sealed in an acrylic holder with a black display core and an exclusive Astronaut Scholarship Foundation (ASF) label. KEY EARLY RELEASES CERTIFICATION – NGC has certified your 2019-W $5 Apollo 11 50th Anniversary Gold Coin to be an Early Releases (ER) coin. It will come sonically sealed in an acrylic holder with a black display core and an exclusive Astronaut Scholarship Foundation label.